The spring 1977 issue (Vol. 1, No. 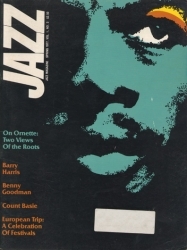 3) of JAZZ MAGAZINE was an all-star issue featuring stories on Barry Harris, 50 years of Benny Goodman, Count Basie, two articles on Ornette Coleman, and a photo gallery of Chet Baker and Dizzy Gillespie. Jazz Scholars Ira Gitler and Dan Morgenstern contribute articles as well! Jazz Magazine was a tragically short-lived publication which ran in the late 1970s and published articles and photos of the highest quality. These magazines a tremendous resource for researchers and Jazz fans alike, not to mention a highly entertaining read!